Have you grown weary of hearing the same old tired blues tracks that way too many performers are recording today? Then take a listen to the very nice Friends, a collection of tunes by American expatriate artist Eric Bibb, who now calls Sweden his home. 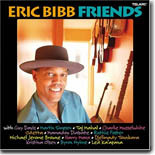 Bibb, son of the 1960s folk singer Leon Bibb, gathered 13 of his musical "friends" for the recording of this album, thus the title. But this is not the normal star-studded attempt to cash in on the names of celebrities to sell more CDs. Instead, Friends keeps Bibb in the forefront of each song, yet imports the unique musical personality of each guest artist to craft a beautiful patchwork quilt of an album. Friends starts with a rambunctious version of the traditional gospel number "99 1/2 Won't Do," with Bibb and the gruff-voiced Guy Davis both playing 12-string guitar and trading off on vocals. It's a powerful number that's very well done by these two New York City natives. Charlie Musselwhite joins in with Bibb and backing band on the dirge-like "Six O'Clock Blues," with Musselwhite playing harmonica. Taj Mahal makes the first of his two appearances on Friends, as he and Bibb trade off on guitar and vocals on "Goin' Down Slow." This classic blues number is given more of a down-home, string band sound by the fiddle accompaniment of Michael Jerome Brown. While Taj doesn't appear on the next cut, "Lovin' In My Baby's Eyes is one of his compositions and Bibb acquits himself well on vocals, sounding much like a younger Taj Mahal. What makes this number really stand out is the wonderful string work of African instrumentalist Mamadou Diabate, who plays the kora, a 21-string West African harp-lute. The effect is stunning, making one wish that this instrument was used more often on modern blues recordings. For my money, this cut's the best of the bunch here. It's one that I want to hear over and over. Bibb teams with Austin, Texas singer Ruthie Foster on the gospel-ish, jazzy original ballad "For You," a song that verges of getting too syrupy at times, but still works. Janne Petersson contributes tasteful piano accompaniment. Exquisite guitar picking is what highlights the folksy Guy Clark composition, "The Cape," on which Martin Simpson guests on guitar and slide guitar. The legendary Odetta, who is attributed by Bibb as one of his earliest musical inspirations, shares vocals on "Tain't Such A Much," a song that the two co-composed. Bill Lee's jazzy string bass work nicely compliments Bibb's guitar playing on the instrumental breaks. Bibb previously recorded the traditional inspirational folk song "Needed Time" on his 1999 release Spirit and The Blues, but he takes this precious song in a different direction here, with Canadian guitarist Harry Manx accompanying him on the mohan veena (an Indian lap-style guitar). The song gets a true international flavor with the percussion work of Kuljit, who pounds out a steady beat on the tablas, an instrument with origins in North India. Moving in a different direction is the simple but incredible "If I Stayed," which features singer/songwriter Kristina Olsen accompanying the pair's vocals on the concertina. This one's got a real flavor of the British Isles. Bibb sings what could be a somewhat autobiographical folk song in "Connected," with Montreal multi-instrumentalist Michael Jerome Browne backing him on mandola and slide guitar. Canadian violinist and mandolin player Byron Myhre joins Bibb on another understated number, "Ribbons and Bows," which is framed nicely by Janne Petersson's accordion accompaniment. Browne returns to take the lead on his own "Just Look Up," playing 12-string guitar and trading vocals with Bibb. There's a touch of traditional gospel on this "feel good" tune. Bibb does some of his best singing on this tune, albeit generally in support of Browne's lead vocals. Bibb sings one of his original compositions, "Cowgirl Queen," on which he is joined by veteran Hawaiian artist Led Ka'apana on electric ukelele. The instrumental medley "Kulanjan / Sebastian's Tune" evolved from an impromptu jam session with Taj Mahal and Mali instrumentalist Djelimady Tounkara, both soloing on borrowed instruments. Taj lays down some mighty fierce licks on an acoustic arch top guitar as well as fretless gourd banjo, while Tounkara borrowed a Gibson guitar for his solo. The result is another wonderful number with a real international flavor. Friends closes with a slow, mellow number, "Dance Me to the End of Love," with subtle accompaniment from Arkansas pianist Jerry Yester. This disc is noteworthy because, like Bibb himself, it consistently dares to be different. Friends should appeal to lovers of both traditional blues and singer/songwriter folk music.